When it comes to preserving, enhancing, and beautifying our smiles, we all want the best. The best care. The best service. The best results. It's as simple as that. Garrett Mulkey, DDS is a unique kind of dentist. He takes a gentle approach, easing any concerns you might have by providing valuable patient education. He listens so he can best understand your particular needs, and he strives to provide the highest standard of personalized dental care using his skilled training in the latest advances in dental technology. As a graduate of Baylor University in 1998, he went on to extend his education, receiving his doctorate from the Baylor College of Dentistry in 2002. He’s a member of the Texas Dental Association, Ft. Worth District Dental Society, and American Dental Association. 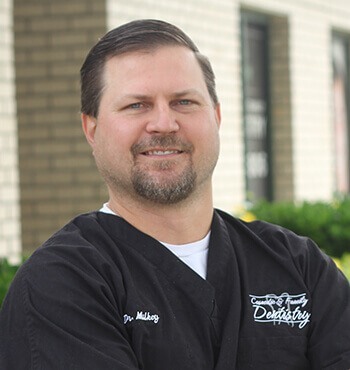 Dr. Mulkey has been practicing dentistry at Weatherford Cosmetic and Family Dentistry since 2002. He specializes in veneers, direct bonding, all-porcelain crowns, implant restorations, placement of mini implants for lower denture stabilization, full mouth reconstruction, and overall smile enhancement. He and his wife, Kim, have two children, Avery and Beckett. His hobbies consist of baseball, golf, hunting, and spending time with his family.